What are common Halloween craft ideas? The basics of fall decorations can be used for a few months. That is why the common Halloween ideas are great. You can use these common decorations through fall, Halloween and Thanksgiving. 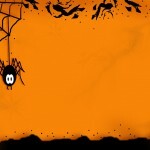 It is not necessarily spiders and witches, but rather pumpkins and scarecrows. Here are some common craft ideas that make excellent decorations and fun. As the leaves start to turn, we know that summer is coming to an end. The fun bright days of warmth and flowers are starting to become the past, and fall colors and cool air is the current atmosphere. In order to emphasize the season, we create crafts and decorations based on warm colors and comfy thoughts. Start with leaves because leaves are a good common sign of fall and Halloween. You can decorate with real leaves or artificial leaves. It is fun to make little leaf ghosts with your children. They are simple. You use a hole-punch to put eyes, nose and mouth in leaves and string them up. It is also beautiful to get artificial leaves and make wooden wreathes, or signs with leaves on them for color. Here are a couple fun ideas. Next, of course, are the pumpkins. They are a common Halloween craft ingredient. The great thing about pumpkins is that as long as you do not carve into the pumpkin, it will last for a long time. You can paint the pumpkin in many different styles. You can use the pumpkin as a centerpiece for your table with leaves and glitter. 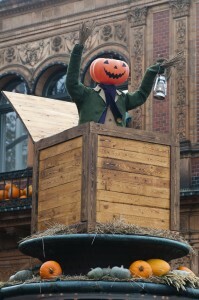 You can use the pumpkin to decorate your porch with a scarecrow and some cornhusks. Here are some other fun ideas. Corn stalks are another fun and common way for decorating for Halloween. You can use them as a base for a porch decoration with a pumpkin and some hay. Or, you can make little corn stalks to go with a bowl of candy corn, a tiny pumpkin and a few pieces of hay for a fun centerpiece. Hay is another way to add the fall feeling to your crafts and yard. Using the hay as a base, you can design creepy creatures to sit on the hay. You can also have pumpkins sitting on the hay for a bit of a lift. Another spooky thing is to have a limb hanging bloody out of the hay. Some other very common Halloween crafts are large black bags filled with leaves. These bags are set up in the fashion of a large spider. One large bag is the front of the spider. This is where you put the eyes and mouth. Then another smaller bag is used for the back half of the spider. Then you attach eight legs that are, again, bags, but they are shaped thinner with rope separating the bag into two sections. Put this all together, and you have a common but fun Halloween decoration that the entire family can participate in making. Another Halloween decoration is a group of small bag ghosts. These ghosts can hang from trees, porches or clotheslines. They are simply the small 3-gallon bag with some stuffing in the top. You use a rope that sections off a head, and some eyes to add detail. You can also add some jagged edges at the bottom also. 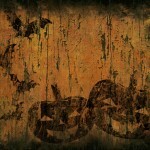 There are so many options available for common Halloween crafts; you can find tons of them on the Internet. Simply go to your favorite search engine, like Google, and then type in Halloween crafts. You will find hours’ worth of crafts and decorations you can make. These crafts will make awesome spooky decorations for your Halloween pleasures.